I HAVE BEEN ROLLING THIS POST AROUND IN MY HEAD for some time now. 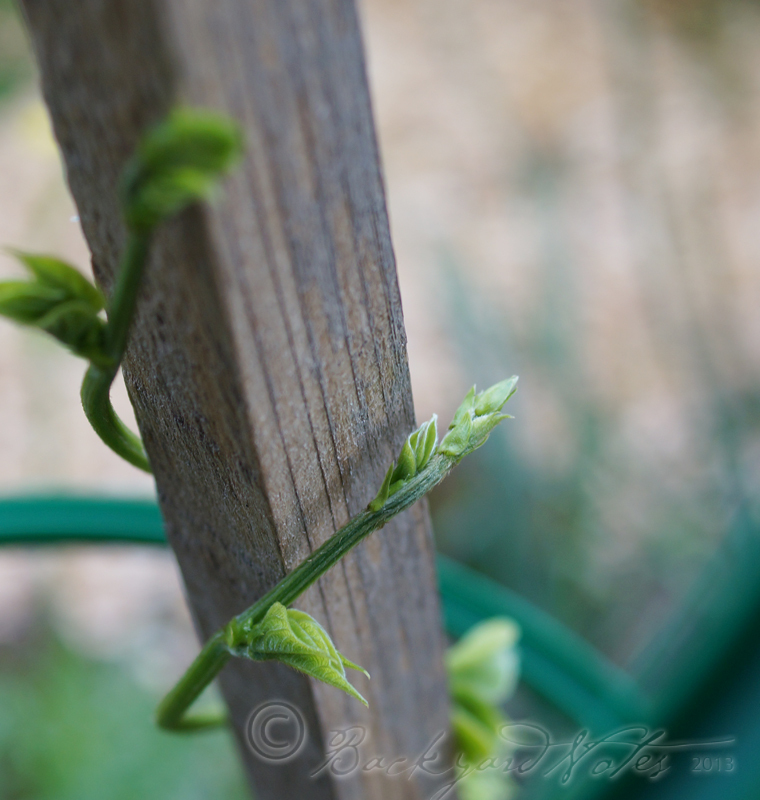 About three weeks ago I spotted a little slip of a clematis. I nearly pulled it out while weeding and adding some new plants that I purchased the garden show. I remember planting it here several years ago under an aging lilac thinking it would be a great support for a clematis. It didn’t seem to do well and I was sure that it had died or that maybe I had moved it. I have a vague memory of moving it, but apparently did not get all of the rootstock; what a surprise! How has it managed to survive? THIS kind of plant behavior always amazes me – I know it shouldn’t – but it does. Plants getting a foothold in the tiniest crack in a rock wall (and turning into large trees), the crotch of a tree, a little hole at the edge of pavement. 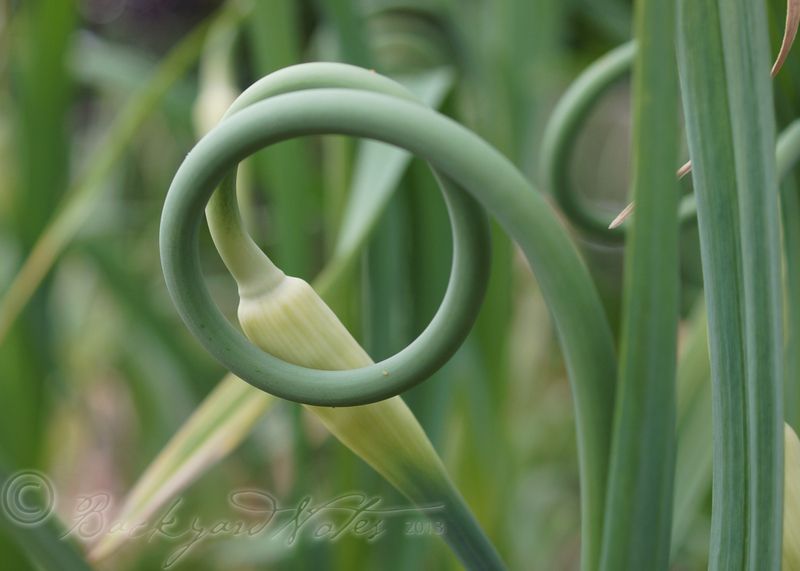 The will to grow and reproduce is paramount and seems to take place against great odds. And this clematis is a case in point since I broke off a six inch piece of it when weeding – what a klutz! 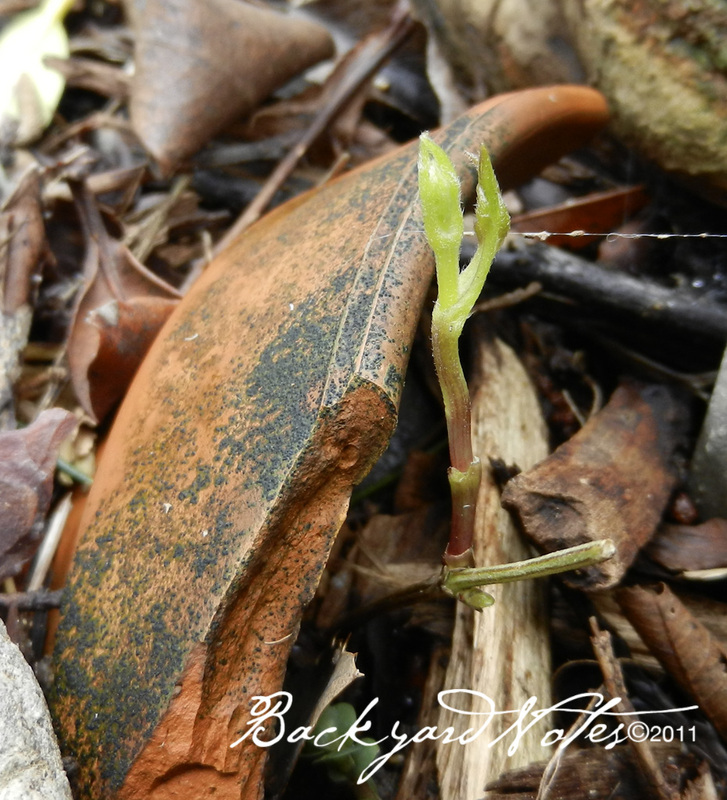 But, the roots are strong and there is new growth as seen in the photo above. Now I will baby it and see what happens this year. With luck it might bloom and then I will know which one it is. 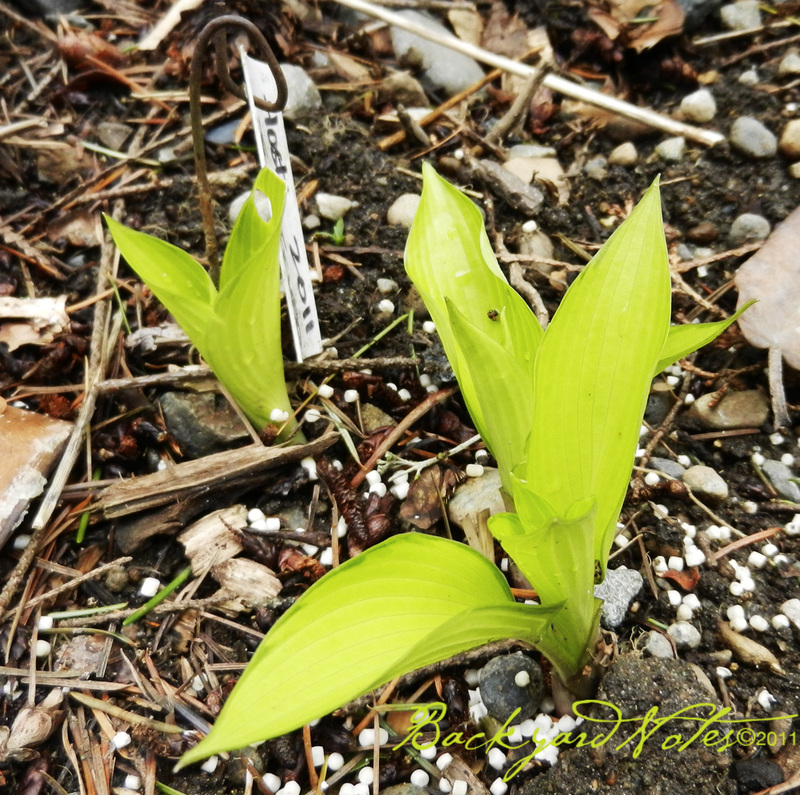 I think that one of the most lovely forms in early spring are emerging hostas. They seem elegant and the color is so fresh. This is a new one, June Fever, from Naylor Creek Nursery, one of four hosta varieties that I purchased from them at the garden show in late February; the others are ‘UFO’, ‘Clear Fork River Valley’, and ‘Blue Angel’. Speaking of the garden show, the display gardens were big! And showy of course, with fancy hardscape details, and lots of large specimen plantings. 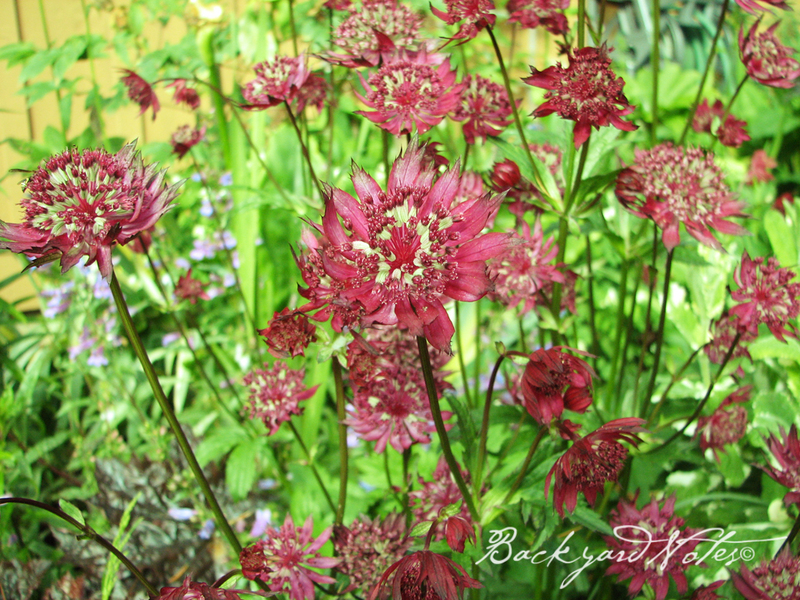 For me, there were few new ideas to incorporate into my garden; but that is not the reason I went. I went for the plant vendors. I was not disappointed and this year I made up for what I did not purchase through all of last year. I bought three daylilies: ‘Seal of Approval’, ‘Night Embers’ and ‘China Bride’ (Naylor Creek-great hosta selections); hachonechloa macra ‘Beni-kaze’, crocosmia x pottsii ‘Culzean Pink’, paeonia mascula ssp. russoi (tree peony), echinacea ‘Sunrise’, and aruncus ‘Guinea Fowl’ (dwarf goat’s beard) from Far Reaches Farm (they have some very cool plants); lilies from my favorite source, B&D Lilies: ‘Rexona’, Belladona’, and ‘Yelloween’; ligularia ‘Osiris’ from Woodland Gardens of Port Orchard (no website), to add to my collection; and a small waterlily type dahlia, ‘Lauren Michele’ (I am partial to simple dahlia blooms) from Swan Island Dahlias in Oregon. Every plant has a home in the garden except for the daylilies and dahlias which are in pots until I figure out their final locations in the garden. Signs of spring are everywhere and it is such a delight after a very dreary and rainy winter. We have of late, had enough fair days to accommodate general cleanup and weeding. 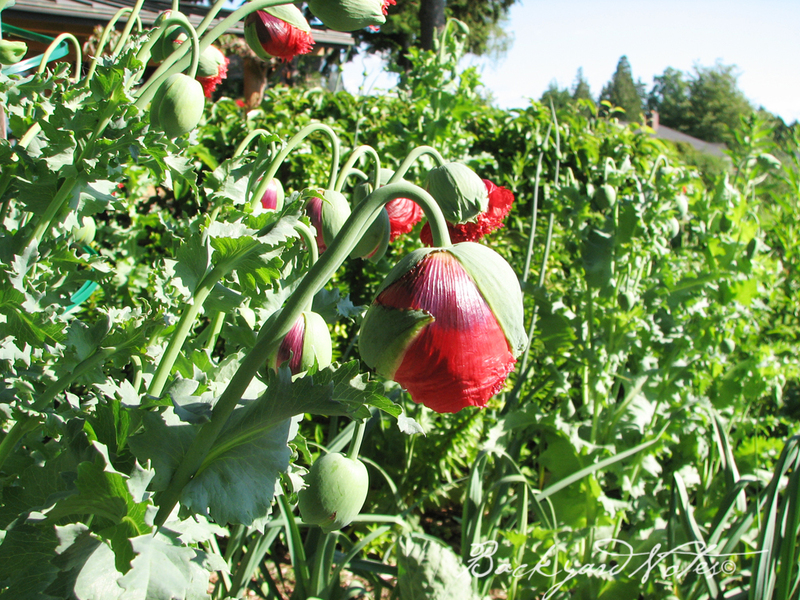 Why is it that weeds don’t seem to have a season and grow the year ’round? 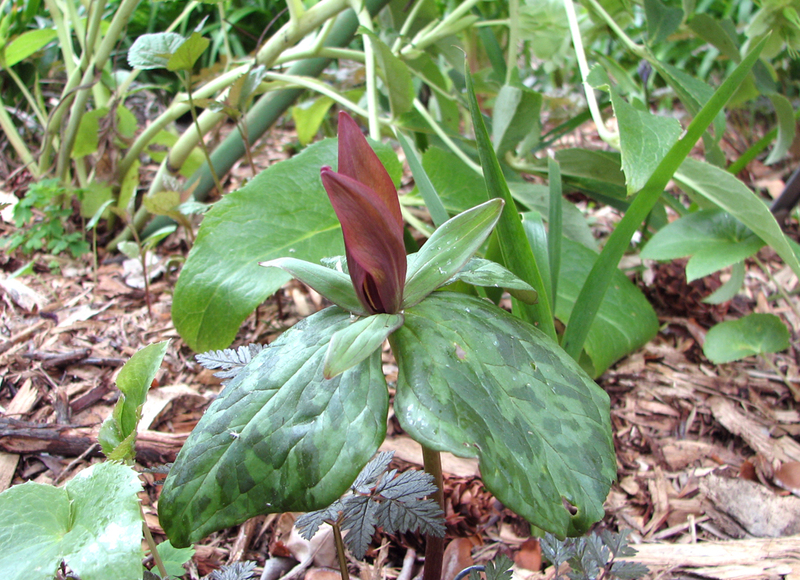 Trillium grandiflorum are in peak form with some are still emerging. 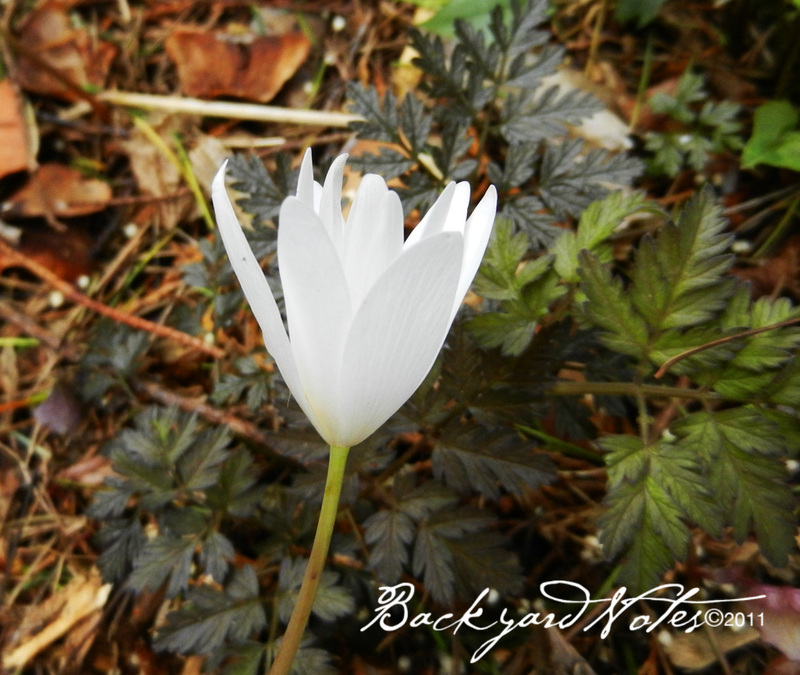 And the beautiful, but briefly appearing sanguinaria canadensis. It is nice to have a camera available and in working order. The biggest challenge is in learning how this one works. I think the macro is pretty good, but I need to study up. Tomorrow it’s time to start tomatoes and peppers. Hooray, summer is on the way! WHERE DID THE LAST MONTH GO? I can hardly believe it has been that long since the last post! 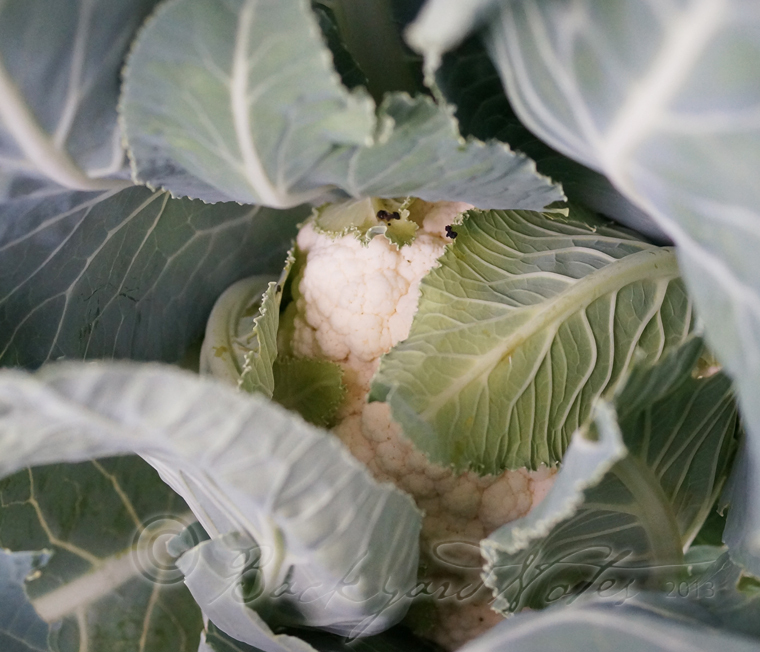 THE PEAS ARE IRRESISTIBLE, PLENTIFUL AND THERE HAS BEEN A LOT OF PICKING AND EATING straight away–no cooking needed! The peas that I have growing are snow peas and snap peas. I have not cooked a single one yet as we have eaten them in the raw state in green salads and as a salad, in a slight variation of the pea and bacon salad found at deli counters over the last fifteen years. 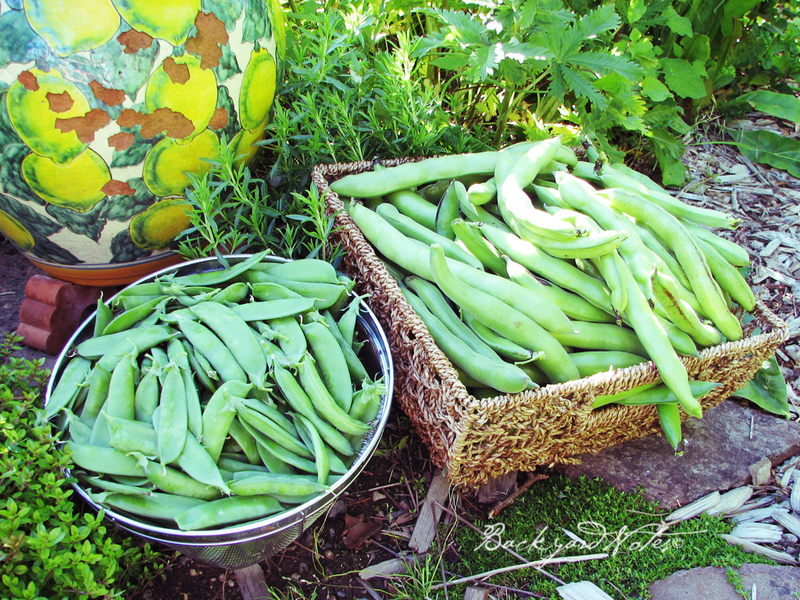 On Friday I picked nearly four pounds of peas and over nine pounds of fava beans! Bountiful! 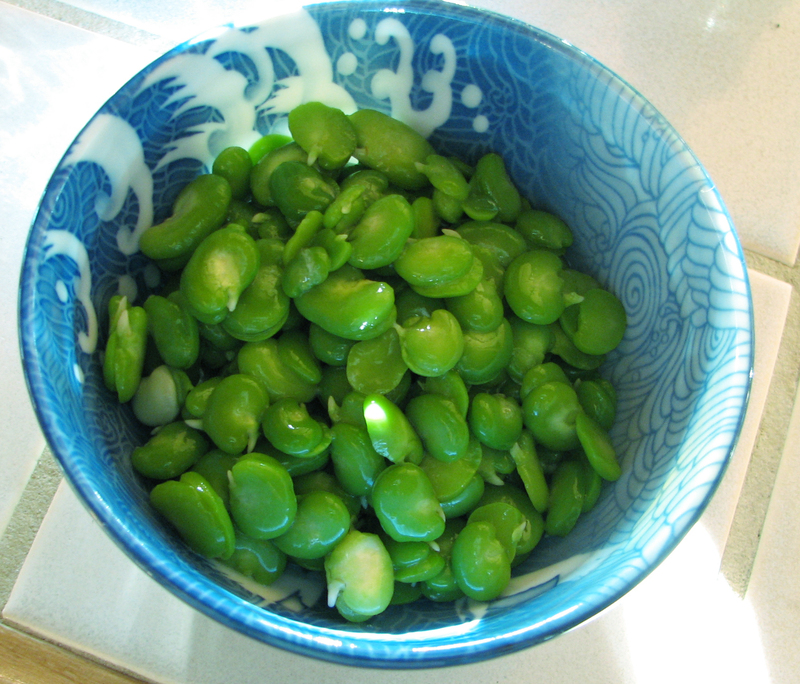 Once the fava beans are shelled, the weight drops considerably. At this stage they are ready for blanching and then slipping off the bitter outer skins to reveal the sweet, tender, green bean inside. The blanched and shelled beans make a tasty spread for bread when puréed with a touch of garlic, lemon and olive oil. 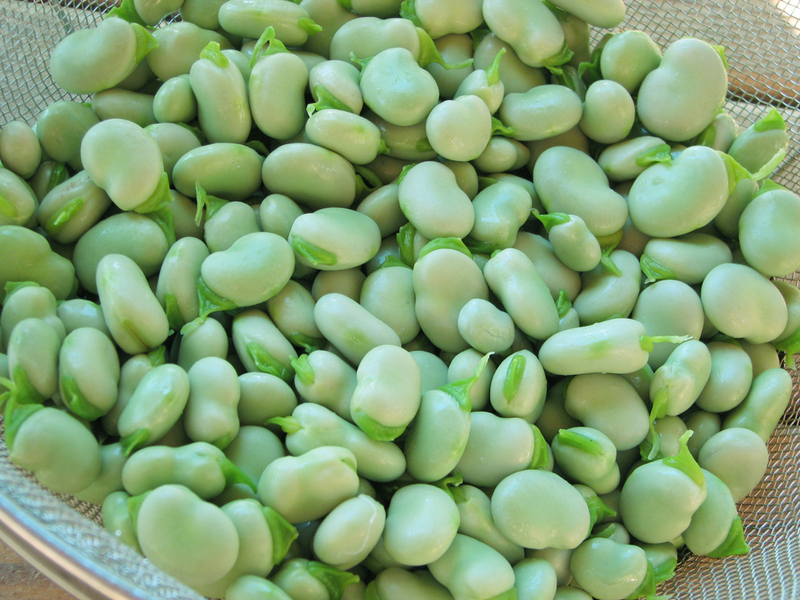 Today I will finish picking the peas and favas so I can finally plant tomatoes, peppers, eggplant, and squash plants. The weather has been so rainy and below normal temperatures for June. But, wishful thinking, summer is just a couple of days away! This might be the latest I’ve gotten the tomatoes into the ground. 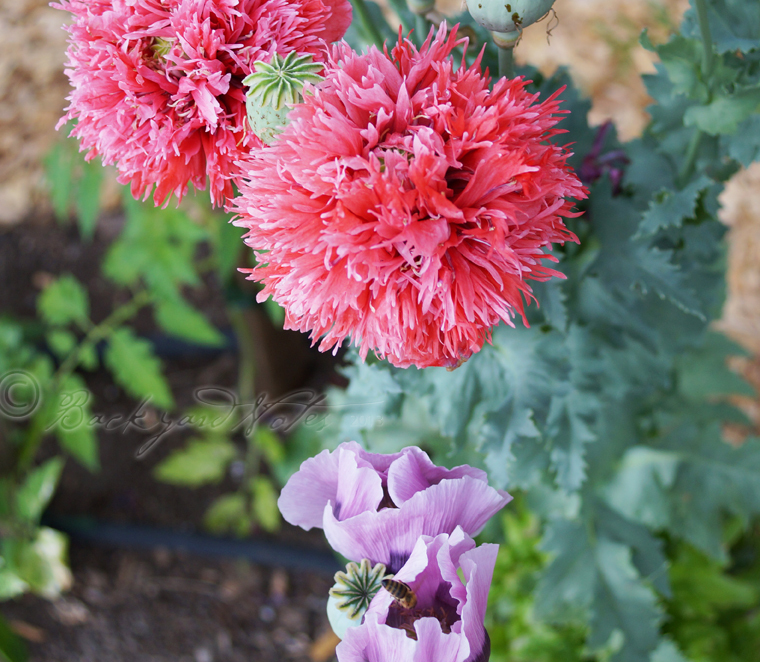 Time for a little catch up on what has bloomed over the last few weeks! and a frilly red one. An unknown mushroom that popped up last week after rain. It is eight inches across! 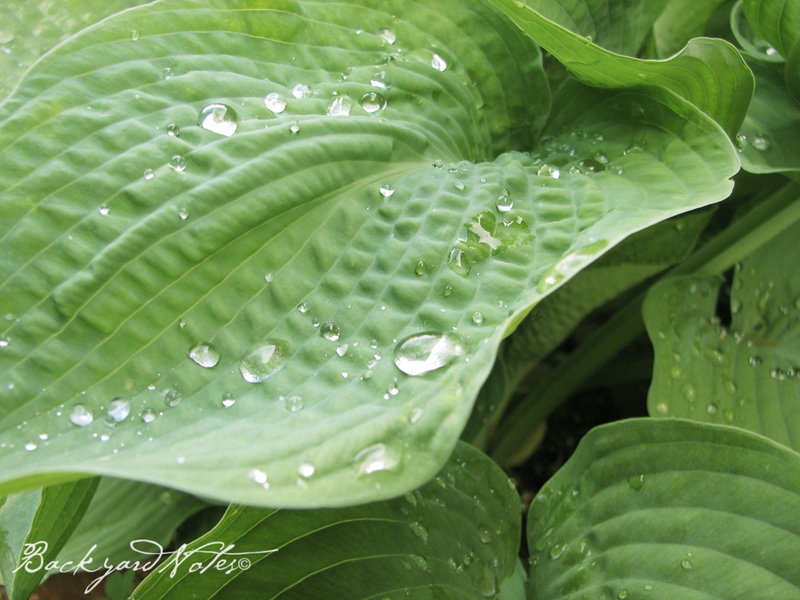 And speaking of rain, it beads up perfectly on the leaves of this hosta ‘Abiqua Gourd’. 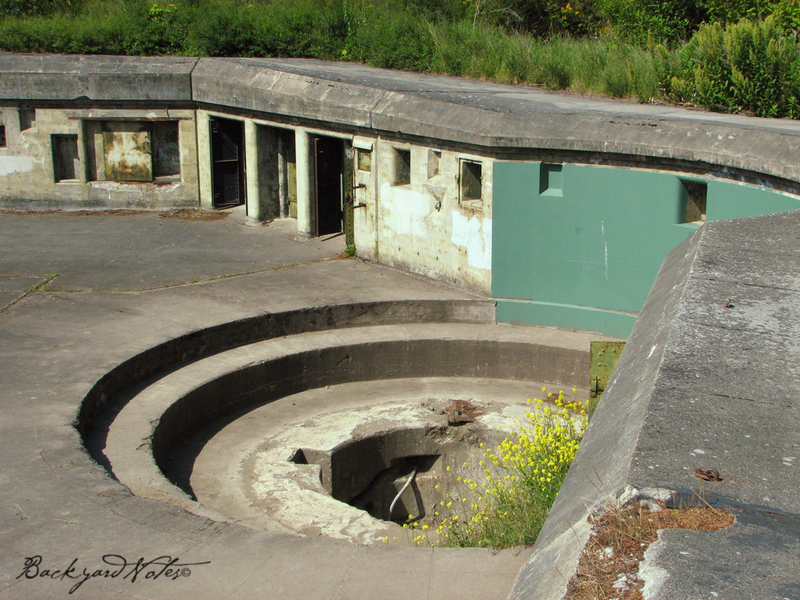 LAST SATURDAY we took a trip north to Port Townsend to meet Erynn and a friend and walk to Glass Beach at the foot of McCurdy Point on the Strait of Juan de Fuca. 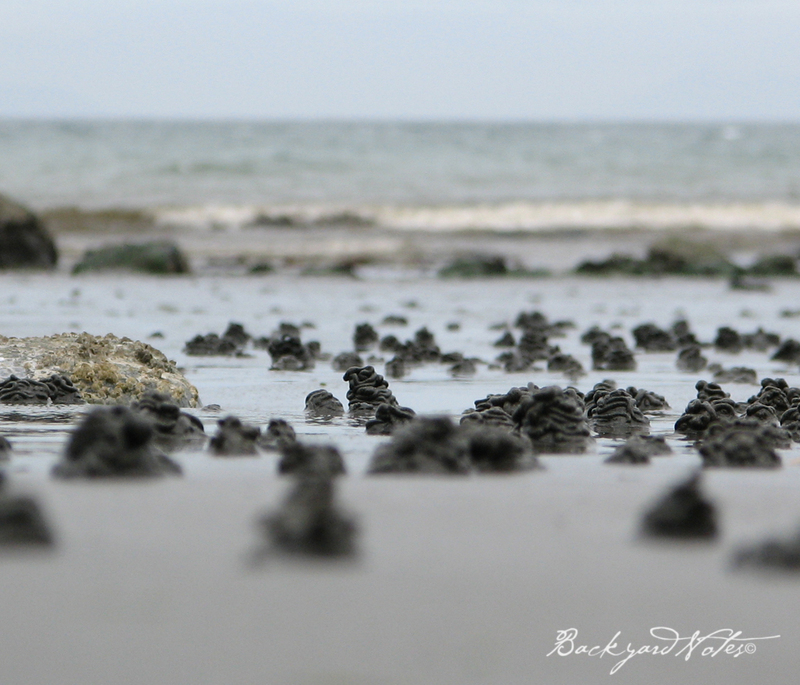 It is a three mile walk each way and with a minus tide there is plenty of time to search for glass treasures and check out sea life that is hidden half of the day. 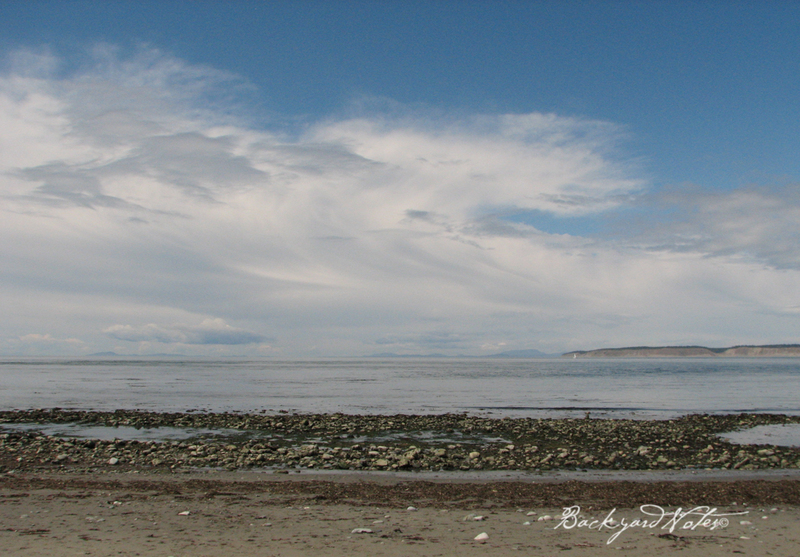 Beach glass, pottery shards and assorted treasures! 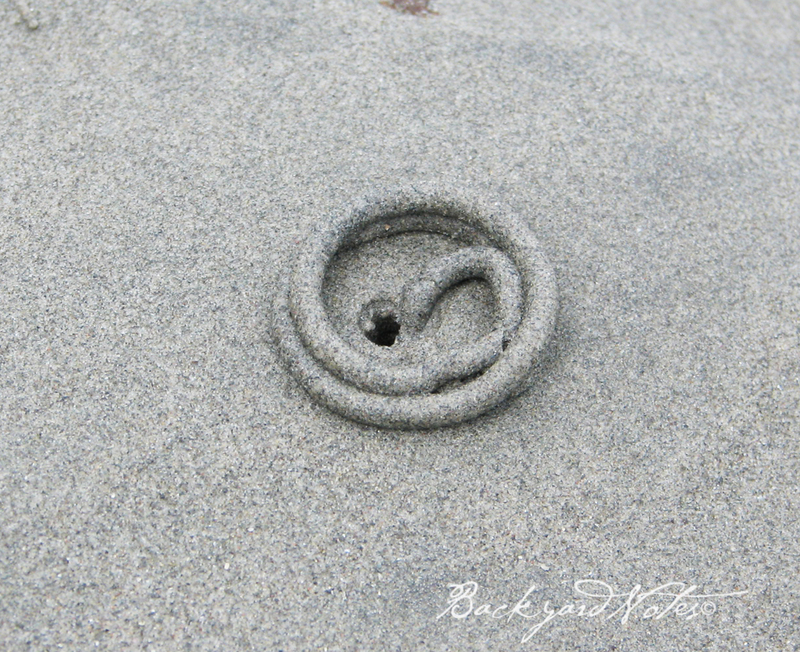 There were thousands of these little sand spirals and piles. Worms? 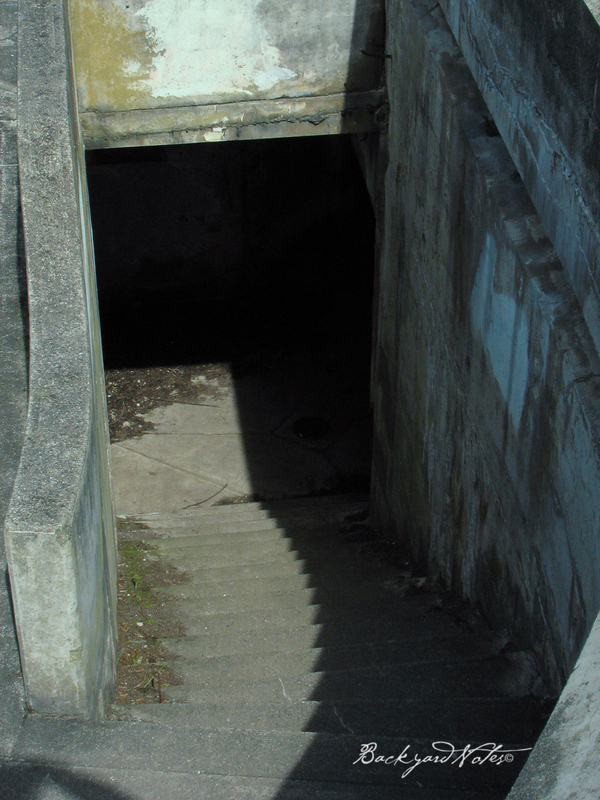 Lots of dark places down stairs and behind big metal doors. 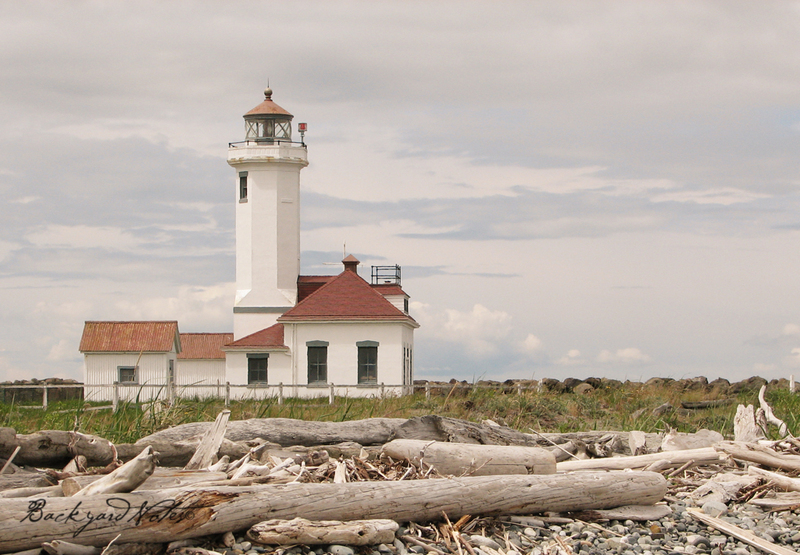 The lighthouse at Pt. 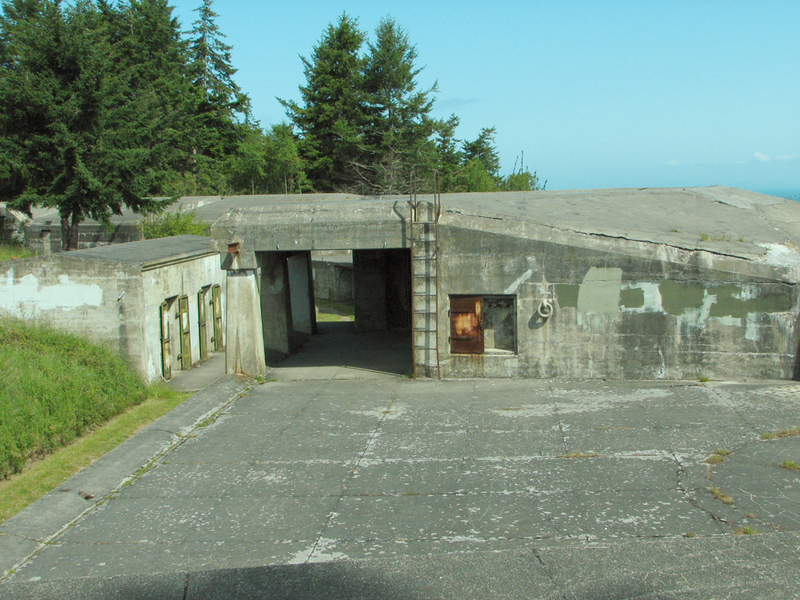 Wilson, just a short walk from the campground. 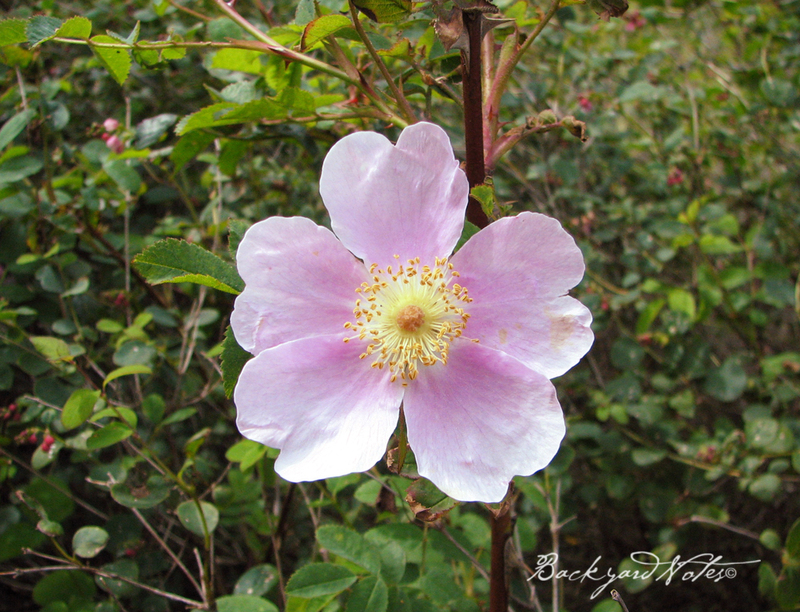 The lovely, dainty Nootka rose. 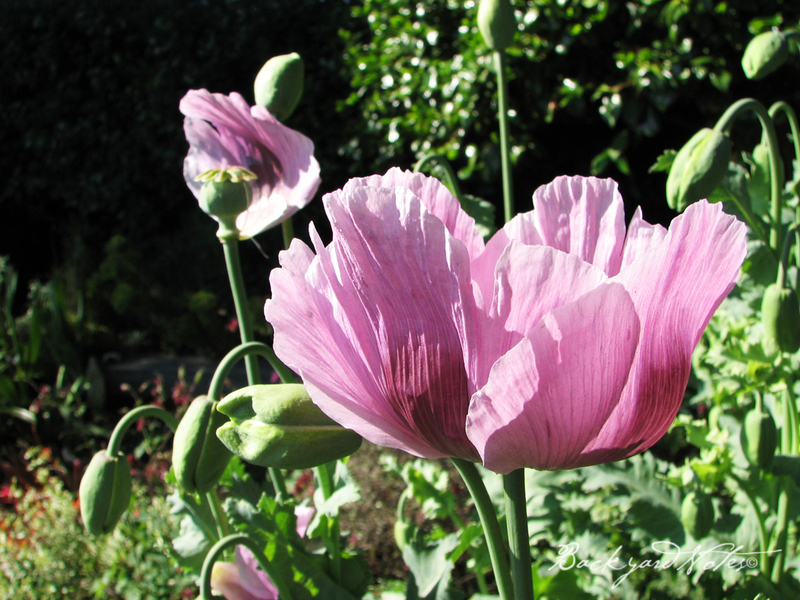 Time now for gardening, the weather today is fair and looking good for at least acouple more. We may even have temperatures in the normal range of 70°! 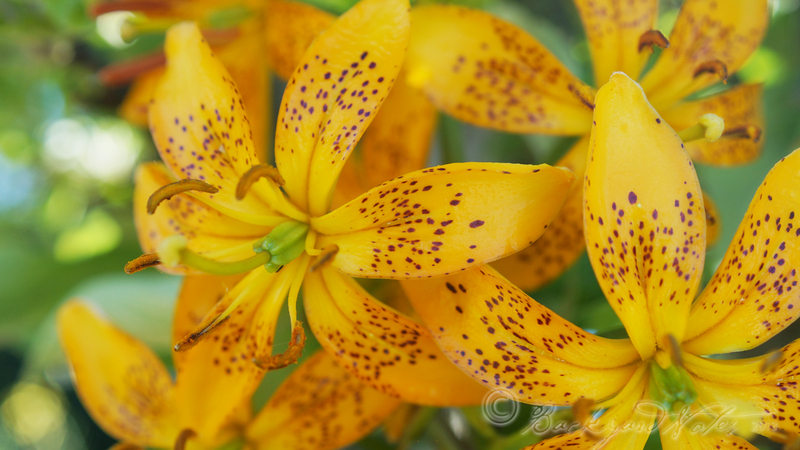 Some of the first lilies are in bloom and a pale blue delphinium too. So much to do! 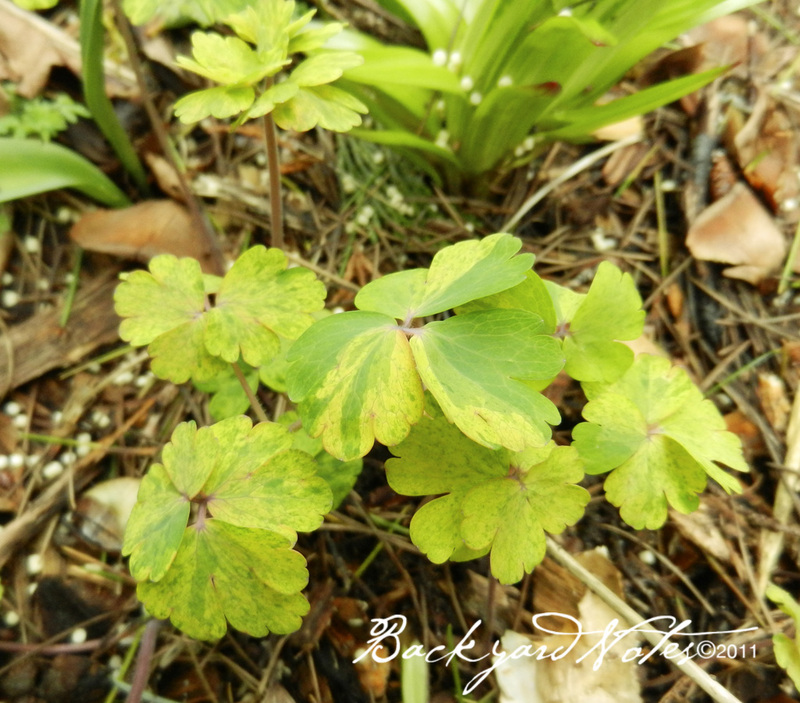 WHEN MOM AND I WENT TO VISIT DEB FOR HOSTA DIVIDING we took a tour of her two acre garden in progress. 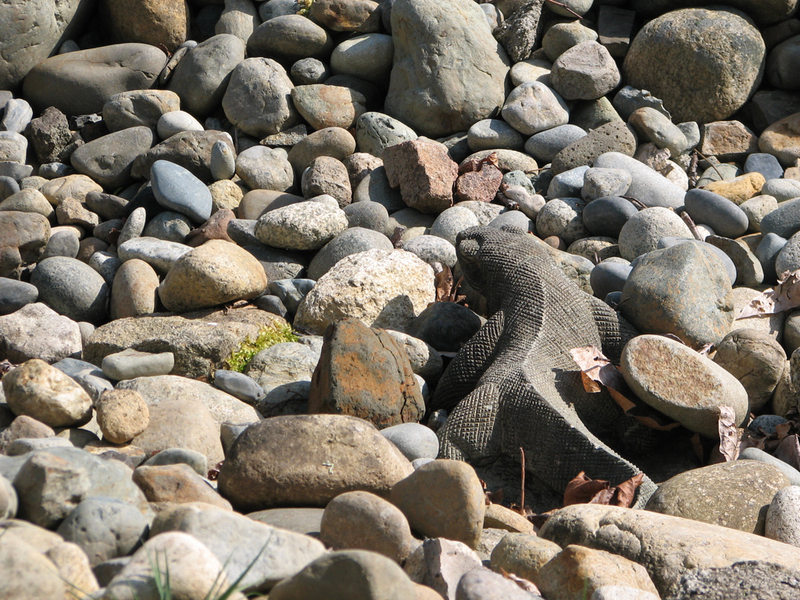 When Deb and her family moved to their house in Snohomish, the areas around the house were a wild tangle of salmon berries, red alders, maples, cottonwoods, willow, and blackberries. Slowly, over the past eleven years she and Vance have removed the blackberry vines, most of the old and brittle cottonwoods, and thinned out the red alders and willow to reveal a small wetland with a tiny stream. Vance is slowly adding conifers to fill in where alders have been. Most of the property is informal and natural looking. This recently completed dry stream bed channels water from a low spot near the driveway down to the wetland area below. 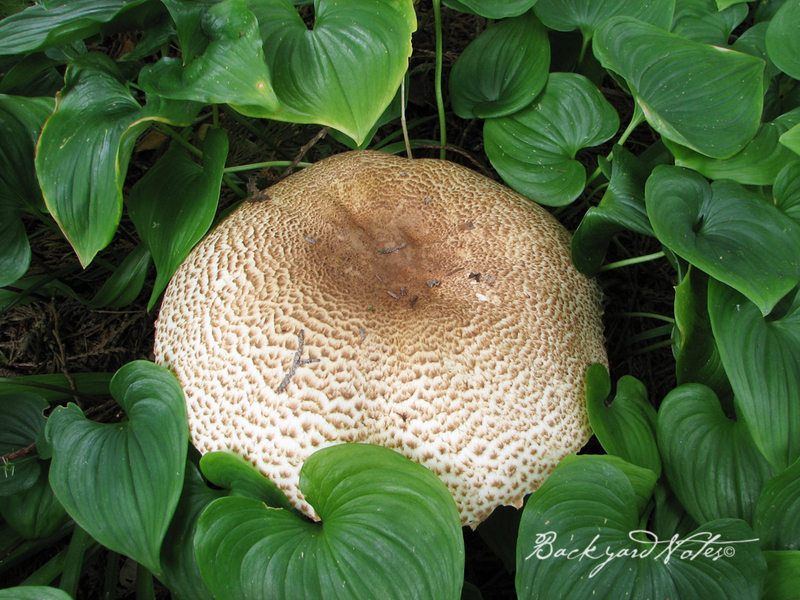 One of Deb’s art in the garden surprises. There is an easy rhythm as we move through the lower wetland area and on around to higher ground where a long path meanders through plantings of azalea, rhododendron, bleeding hearts, and other native type plants on our way back toward the house. They have created a park-like calm, tall trees overhead, dappled sunlight sprinkled over the paths. 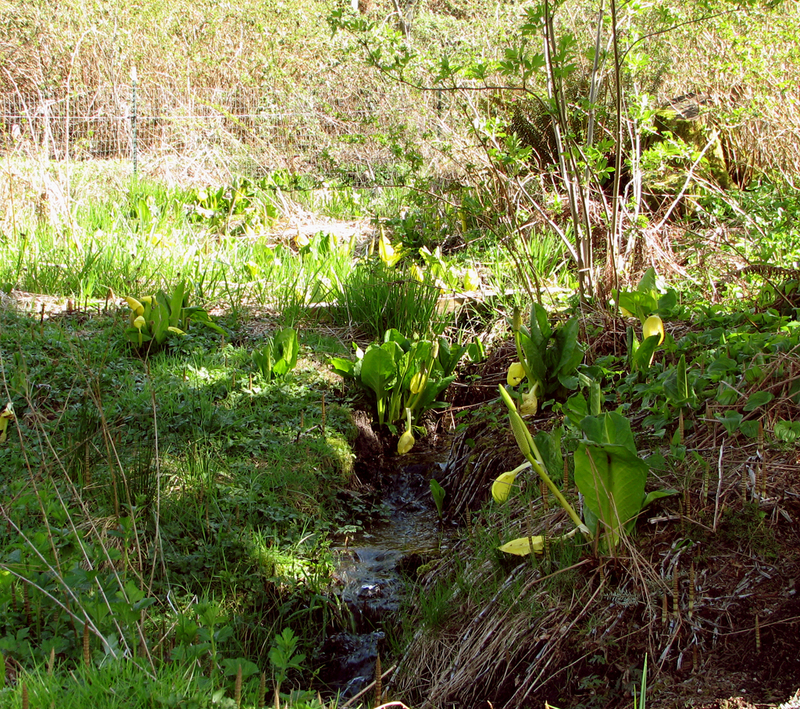 The western skunk cabbage, Lysichiton americanus, was in its full glory. I love the sheer size and boldness of this plant. It makes me happy when and wherever I see it in spring. There is something very wild and slightly grotesque about it, the eye-popping green and yellow as the sun strikes the leaves and sphathe. 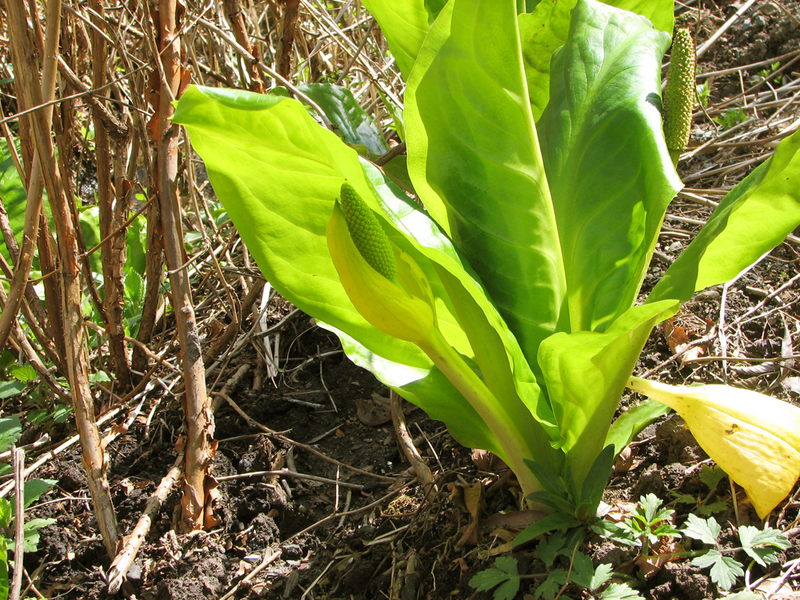 It is part of the arum family and altogether different in appearance from its eastern relative. 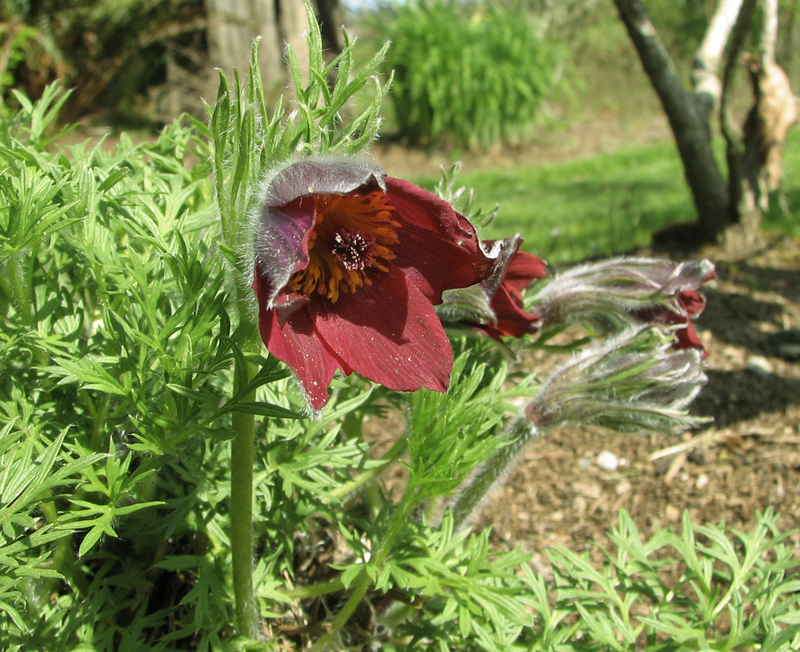 Here, it sits among the naked legs of salmon berry, which along with red currant were also in bloom. A pulsatila along the path back to the house. Closer to the house Deb has several large and small ‘islands’ for perennials and shrubs, many from our grandmother’s garden. She is partial to rhododendrons and is creating quite a collection of them. She is lucky to have just about all the right conditions for a great garden: distinct areas of wet, dry, sun, shade, and a good eye. She has done a brilliant job of weaving the natural and the imposed together. 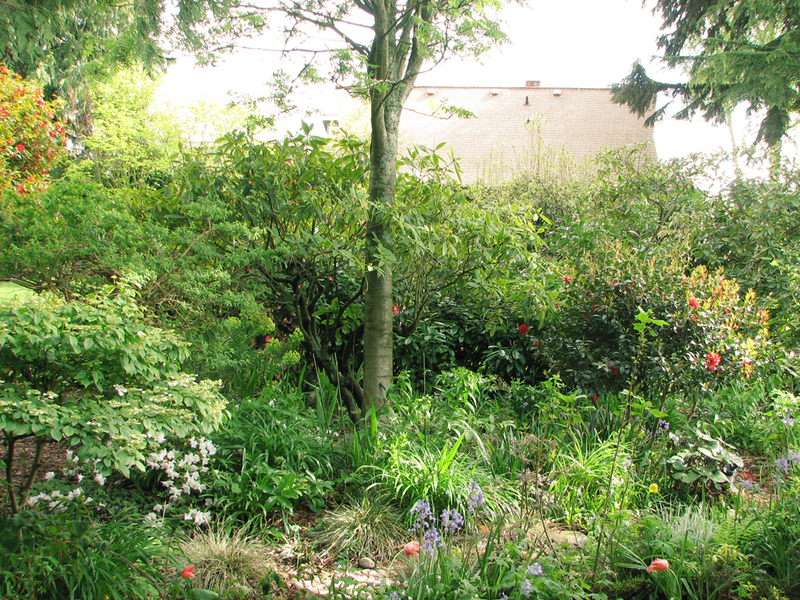 What will it look like as a mature garden in another five or ten years? BACK ON THE HOMEFRONT, I continue to record the unfolding of spring’s largesse. 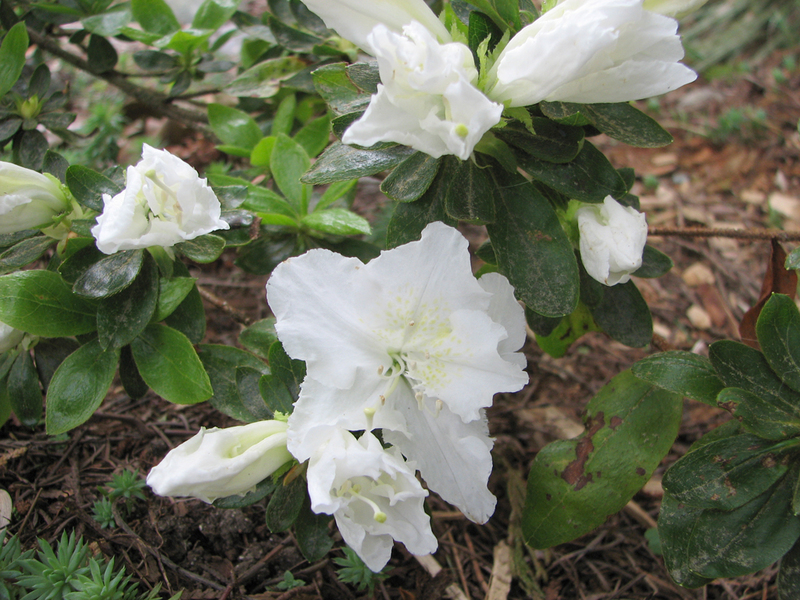 This azalea, ‘Marie’s Choice’ was planted thirteen years ago and amazingly has lived up to its size description: 2.5 ft tall x 3 ft wide in ten years. It it pure white with a light fragrance. It has summer shade below a tall pink fucshia magellanica var. molinae (the topic of post to come). 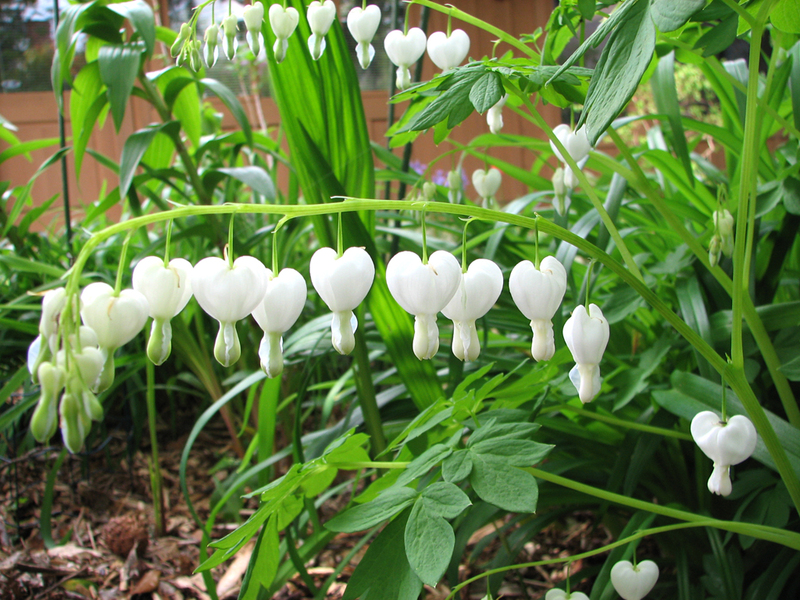 And just beyond the azalea is a lovely white bleeding heart, dicentra spectabilis alba, a graceful necklace of little charm sized flowers along a thin, green stem. Also nearby is trillium sessile. 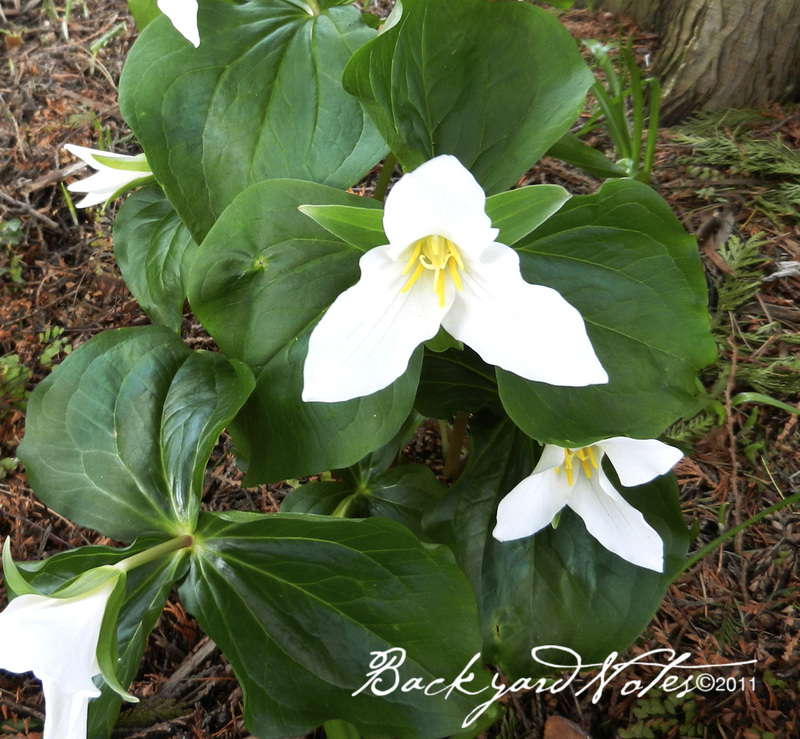 This trillium is not native to the northwest but hails from the midwest and southeastern U.S. It lives up to its reputation of being fussy and now the lonely one of three originally planted. I hope it will eventually form a little colony here, under the mountain ash and rhododendron. Certainly seems like the right location. These plants pictured above are part of a small plant community in one little area of about 12ft x 15ft on the southeast corner of the house that I look out to from my office. The sheer number of plants packed in here is astonishing when I stand back and really look at what’s here. 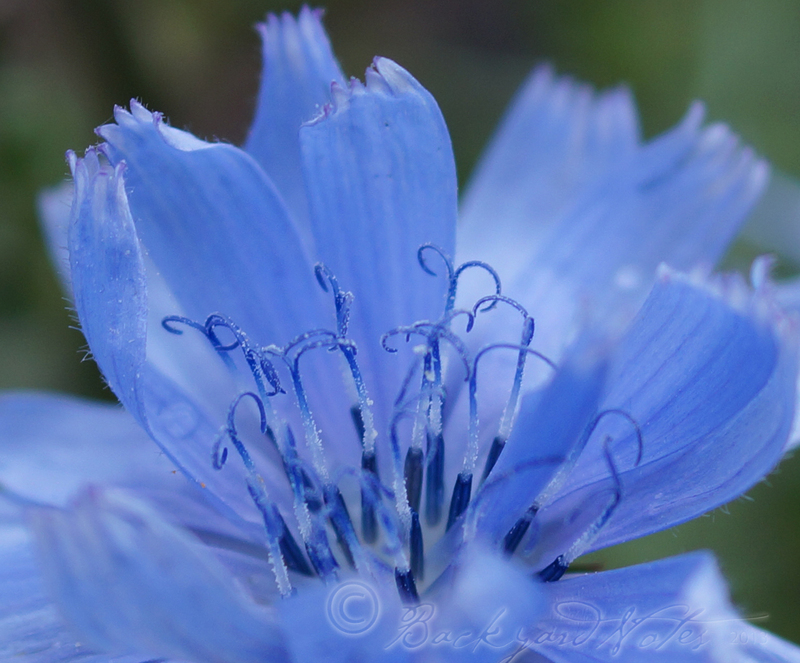 As the garden has developed over the past fifteen years there have been fits and starts, successes and failures. But now, this spring it looks really vibrant and full. Can I possibly squeeze in another plant? The anchor is a mountain ash that was only about twelve feet tall when we moved to the property in 1992. Now it is over thirty feet! 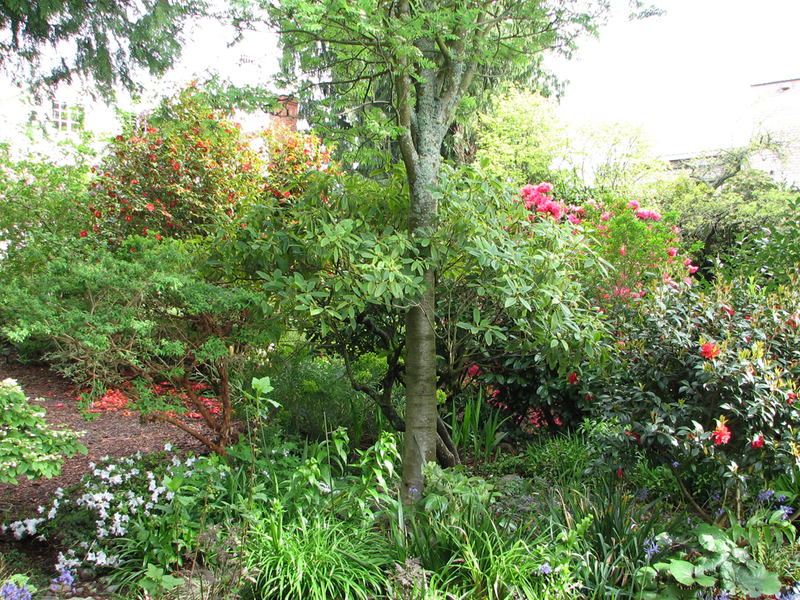 Growing around the base of the mountain ash is an old pink rhododendron, about eight feet tall, then a succession of smaller shrubs and perennials. 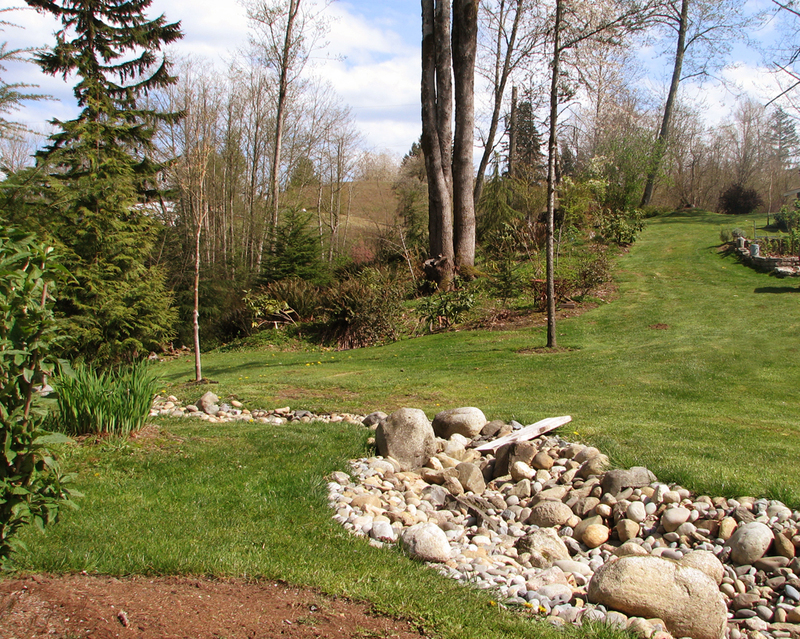 A dry streambed channels runoff from the sloping driveway and away from the house and breaks up the garden visually. Within the framework of what was established before I started my tenure here, I have tried my best to plan for year round interest combining size, color, texture, and water and light needs. This garden has morning sun and early afternoon sun most of the year and full shade after 3:00 p.m. in the summer. It also tends toward the dry side in summer and is challenging to compete with the extensive feeder roots of the red cedars. So, in the confines of a city lot this small area could pass for a complete garden, but is just one of many on the property and in this context shares some similarities with my sister’s two acre park. We are both creating gardens for the same and different reasons. It is at once relaxing and work, a way to unwind and think of nothing else; it brings joy and serenity and is pleasing to look at the finished work; it brings color and texture to life; and, gardens are refuges for birds, animals, insects and people–all important to improving the quality of life. I think we learned this inadvertently from our grandmother by having the opportunity to observe the beauty of her efforts. And on that note, time to close out this rather long post.